The Eastern Mediterranean gave wine culture to the world, yet made terrible wine for 2,000 years, but in the last 15-20 years has undergone an exciting wine quality revolution. It is now a modern, dynamic, exciting wine region, in one of the oldest wine growing regions on earth. The wines of Lebanon and Israel have been the ones leading the charge, and lately Turkey has had a great deal of attention for its indigenous varieties. Even a Syrian wine has been widely praised. Cyprus would seem to have been left behind in the noise stakes, but there, there have also been exciting changes, wine wise. What is unique to Cyprus is that they have high altitude vineyards up to 1,400 meters above sea level. These are amongst the very highest in Europe. They have indigenous varieties and many old vine vineyards. Furthermore, as an island, Cyprus never suffered from phylloxera, unlike most of the world of wine, and so have ungrafted vines. They also have Commandaria, a unique and historic dessert wine. Reference to it goes back to 800 BCE, and it was named since the Crusades in the 12th century, which in itself makes it by far the oldest wine brand. I always say Israel is not an island and kosher is not a country. Our wines are part of the Eastern Mediterranean wine region, and no doubt the wines of the eastern med should be listed together on the wine list and displayed together on the same shelves. The world is big and we are small. Certainly, the region taken together is a lot more interesting than these small, individual wine countries on their own. We are a little insular in Israel thinking everything revolves around us, so it is instructive to look around and see what we can learn from our neighbors. There are contacts that go way back. ‘Yayin Kafrisin’ was mentioned in the ancient sources. It has been alternatively translated as Cyprus wine or caper wine, and was most likely both, and it was even an important ingredient in the incense used the Holy Temple. Today there are kosher & Israeli connections. The Lambouri Winery produce a white and red Yain (sic) Kafrisin, which is certified kosher. They first made it in 2008 and have made another kosher batch now. 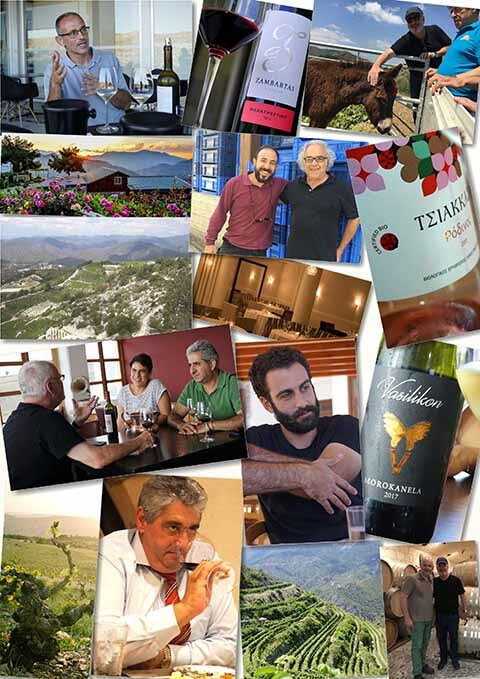 The Israeli winemaker Doron Harkness, now Carmel, worked for the Tsiakkas Winery for a short time. Also Lin Gold, ex Ella Valley, is today the winemaker of the Israeli owned Gillham Vineyard Hotel complex. The paradox is that the wines of Cyprus were far more visible to the world thirty years ago. Then Cyprus, a tiny country that makes Israel look big, produced three times more wine than Israel. The mountains, slopes and valleys were covered in vines. Families grew grapes as a matter of course. This, more a way of life than a profession, was passed down through the generations from grandfather to father to son. The inaccessible, steeper vineyards were worked with the use of donkeys. Grapes were used to make wine, for eating, to make raisins or for some of their delicious, sweet bi-products they make from grape syrup. The remainder was distilled to make the national spirit, Zivania. Wine sales were bloated because of the receptive markets for inexpensive wines including Sherry style wines sent to the UK (remembering Emva Cream Sherry, a massive brand in its time), Sangria to France, Gluhwein to Germany and cheap bulk wine to the old Soviet Union. Sales were massive but there was no desire, or need, for quality. 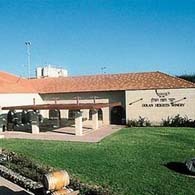 Four monopoly style wineries (like Carmel Mizrahi in Israel), dominated the domestic market. These were ETKO (founded 1844), KEO (est. 1928), and the cooperatives, LOEL (1943), and SODAP (1947). They together had well over 90% of the market. Then the market was destroyed when use of the name Sherry was outlawed unless from Spain, the Soviet Union collapsed and the bulk markets disappeared overnight. When Cyprus joined the EU, the country became open for imports from Europe and the domestic market became exposed to competition of price, quality and volume. It had to change direction or be swallowed up. What happened was that wineries moved to the mountains, like in Israel, where wine growing moved from the coastal regions to the Golan, Galilee and Judean Hills. KEO moved its production to Mallia, SODAP to the Kamanterena Winery at Stroumbi and ETKO to Olympus Winery at Omodus. A new generation of boutique wineries was born. The young generation abandoned vineyards, and whole swathes of vineyard areas have been abandoned. A positive consequence of this is that wineries have become wine growers. Production dropped to less than a third of Israel, and today the big four account for less than 40% of the market, much of this unseen bulk wine. I found a wine industry newly focused on quality and maximizing on its indigenous grapes, but I also find an industry that was lacking self-confidence, introverted, way behind its neighbors’ in marketing the brand called Cyprus wines. Prices are low and compressed. There is not that much difference between a winery’s inexpensive brands and their flagship wines. The leading wineries have different policies. For instance, Vlassides, owned by a UC Davis graduate, & Kyperounda, a small cog in a large diversified company, both focused on international varieties. Zambartas, whose owner winemaker graduated in Australia, was founded on the idea of blending a local variety with an international one, whilst Vouni Panayia, set up by a veteran of the Department of Viticulture, focuses on local varieties only. Tsiakkas, owned by a banker turned winery owner, was internationally focused but now is a big supporter of local varieties, and this seems to be the direction echoed elsewhere. There are two main grape varieties that dominate everything in Cyprus. One is the white variety Xynisteri and the other the red variety Mavro. Xynisteri is the main Cypriot variety with marketing potential. It does not quite have the pulling power of the Greek Assyrtiko, which is leading the whole surge in interest in Greek wines, but is the most authentic taste of Cyprus in a glass. After years of making insipid characterless wines from this variety, wineries understood vineyards from altitude could produce refreshing, zesty wines which are certainly of interest to the wine lover and connoisseur. The best of these is the Kyperounda Winery’s effort from vineyards at 1,400 meters above sea level. Their Petritis is arguably the show case white wine of Cyprus. Thanks to the legendary CEO of Keo, Akis Zambartas, native Cypriot varieties were saved from extinction and revived. He went on to found the small winery called by his family name. One of these varieties with better quality potential is the Promara, which has the broad mouthfeel similar to Chardonnay. The Vouni Panayia version was the best I tasted. Another revived variety is the pleasantly aromatic Morokanella, which reminds me of Malagousia, the recently revived Greek variety. I tasted good examples at the Aes Ambelis Winery, the nearest winery to Nikosia, and the Vasilikon Winery, near Paphos. No doubt these two are the white varieties to watch in the next few years, but in the meantime Xynisteri remains the main ambassador of Cypriot wine. The Mavro is a high cropping red without great potential, though treated right it can have a beautiful strawberry, raspberry aroma. As long as it is realized, that this not going to be a Cabernet, or even a Xinomavro or Agiorgitiko (the famous Greek red varieties), then a nice summer red wine can be made. The best I tasted was made by Tsiakkas Winery, and Zambartas Wineries has a Mavro made from nearly 100 year old vines with a remarkably sensual nose, which is still in barrel. Mavro is part of the Cyprus wine DNA, and it is good to see wineries making these attempts. Overall though, the Holy Grail of Cyprus wine will not be found in the Mavro grape. More interesting quality wise is the Maratheftiko (aka Vamvakada), a red variety which has an ethereal flowery aroma, that lifts the berry fruit. However, it is notoriously difficult to grow having a self-pollination problem that can leave bunches decimated, like a hand missing fingers. One of the solutions is to inter plant another vine like Xynisteri every three vines. This solves the pollination problem, but creates others. The best examples are made by Ezousa, Zambartas and Tsiakkas. Newer still, and with more focused deep berry fruit is the Yiannoudi variety, which provides similar growing problems. This is probably the one with the most potential in the long run. I liked the Vlassides experimental version, and the wines produced by Vouni Panayia and Tsiakkas also show the qualities of this variety. When I visited Cyprus in 2003 I came across the Lefkada a tannic variety of Greek origin, which I thought was ideal for blending. I was pleased to see that Vasilikon Winery make a very creditable wine from this varietal. Of course, international varieties are prevalent. The Vlassides Shiraz, Kyperounda Chardonnay and Vasilikon Cabernet Sauvignon are great wines. Shiraz seems to be a perfect variety for the eastern med. What is true for Cyprus is also true of Israel and Lebanon. I was fortunate to have the opportunity to taste an Ezousa Maratheftiko 2009 and a Vasilikon Cabernet Sauvignon 2001. Both showed excellently. This illustrated to me that contrary to rumors by doubters, Cypriot wines can age successfully. Most wineries make rosé, and this is a style of wine Cyprus makes well. It seems to be somehow symbolic of the beautiful Mediterranean island and the local cuisine. Commandaria is still there, like a time capsule representing the ancient world. There is the old style that has not changed in centuries (or millennia) and some wineries are now making a more approachable modern style. The fruit comes from villages in the Limassol region. The varieties are exclusively Mavro and Xynisteri. The grapes are late harvested and then dried on mats for a week or two. 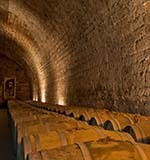 The wine is fortified, which is optional, and then aged for a minimum of two years usually in old, used 500 liter barrels. The blends are made from an approach similar to the solera system in Sherry. The ETKO Centurion is rich and unctuous made in the traditional way, whilst the Aes Ambelis is made in a more modern style. Both are outstanding. Tsiakkas also makes a relatively light almost refreshing Commandaria, which is sensuous and enchanting. They also make a very good oak aged Zivania. As far as the regions are concerned, the official wine regions of Cyprus are confusing as they don’t fit the reality any more. In this Cyprus has a great deal in common with Israel where the official wine regions are also out of date. Basically the main wine growing areas center on the Troodos Mountains towards the central – south western part of the country. There is the area of the northern Troodos mountains, south of Nikosia, is known as the Pitsilia wine region. Here it is possible visit the Aes Ambelis, Santa Irene and Kyperounda wineries. At Santa Irene, there is a restaurant for refreshment. The most concentrated area of wineries is in southern area north of Limassol. Here it is possible to see Tsiakkas, Vlassides, Argyrides, Zambartas and Lambouri wineries and also visit one of the big boys, either KEO in the village of Mallia or Olympus in Omodus. In the Paphos area in the west of Cyprus, you can visit the Vouni Panayias Winery in the Vouni Panayias – Ambelitis wine region, and Vasilikon Winery in the Akamas Laona Region. It is not so far from Kamanterena Winery belonging to the large cooperative SODAP. Here it is possible to eat at either the Vouni Panayias or Vasilikon wineries, where they have large restaurants. Everywhere I was amazed by the most stunning views, leaving memories of thick gnarled old bush vines, usually of Mavro and Xynisteri, steep inaccessible mountain vineyards and old stone wall terraces. Visit Cyprus wine and you have to visit the vineyards, which are the essence of the wine country. The two most beautiful wineries are Vlassides in Kilani, which is in a modern streamlined design reflecting style and elegance and the compact Argyrides Winery (Vasa village), a beautiful model type winery built with impeccable taste in stone and wood within a traditional building. The vineyard soils range from chalk and calcerous clay, in the Paphos area, where the soil can look white, to more volcanic & sandy elements in the Limassol region, but that is a generalization. In reality vineyards are a patchwork of soils and terroirs. Where to stay depends on the experience you want to receive. You can be a tourist or go ethnic….and it is no problem to stay in one place. Cyprus is small enough to travel from one base. This can be in Limassol or Paphos in one of the tourist hotels on the beach or in a more sparse village atmosphere. I had experience of Thanos Hotels in Paphos, a perfect choice because one of the hotels (Almyra) has an Israeli general manager, another (Annabelle) lists Israeli wines on its wine list (Tulip) and the Chairman of the Cyprus Sommelier Association, Georgios Kassianoss, works there. If you want to learn about Cyprus wine, he is a knowledgeable source of information, as well as being a larger than life character. In 2020 ‘The Best Sommelier in Europe’ competition is coming to Cyprus. It is a great compliment to Kassianoss and his colleagues. Both hotels have sea front restaurants offering typical Cyprus food with a great selection of local wines. As regards food, Cyprus is the essence of the Mediterranean and their wines combine perfectly with their food. If you want a more traditional village experience in the mountains, I recommend the ‘Farmakas Living’ accommodation in the beautiful village of Farmakas (in the Pitsilia region south of Nikosia)…with steep 100 year old vineyards and Santa Irene Winery nearby to provide food, the wine experience and refreshment.. Overall, I believe Cyprus is so close to Israel and such a beautiful, authentic wine country, that is a must to visit for wine tourists. Certainly Cyprus has joined the wine revolution experienced by the rest of the Eastern Mediterranean. A country of sun, sand and sea, along with mountain vineyards, local food and authentic wines – where wine quality is on an upward spiral.